This lemony flavored grass has a hot and spicy surprise waiting underground. The blanched white end of each stalk of Lemon Grass adds a sharp lemon tang to soups and stir fries and is an essential ingredient in many Asian dishes. After a good size clump of Lemon Grass has developed, pieces can be broken off at the base of the clump for cooking. And, while we don't cook with the coarse leaves, they do make great sun tea. Just a word of caution though, when you work around your lemon grass plants, be sure to wear long sleeves because the blades of the Lemon Grass plant are extremely sharp and can slice you to ribbons. Also make sure to remove any blades from food. These can get stuck in the throat and cause extreme discomfort. Lemon Grass is a tender plant and should be protected or brought in where winters go below 10 degrees. It likes full sun and very warm summers. It will go dormant in the winter but should not be cut back until it warms up in spring. The dead grass helps to protect it from the cold. If you don't use your Lemon Grass fast enough, you will want to divide and replant when the plant gets two feet or so in diameter. 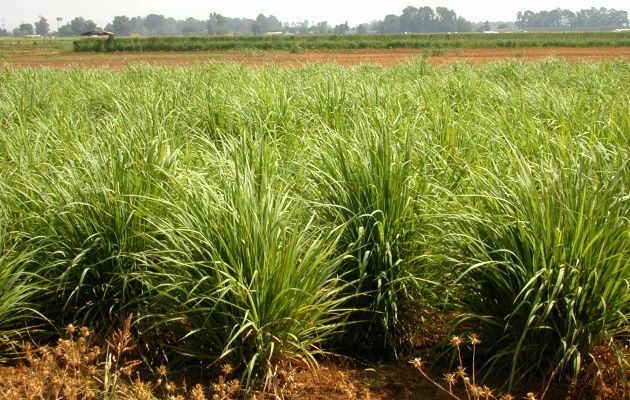 True Lemon Grass cannot be grown from a seed. It is always propagated by division. Seeds sold as Lemon Grass are actually a different species which never makes the white fleshy part of the stem used in cooking. This seeded variety is CymbopogOn flexuosus. Closely related to Lemon Grass, but not used for cooking, is Citronella Grass, Cymbopogon nardus. This is the commercial source for Citronella Oil. Lemon Grass is one of the six plants chosen to be in our Biblical Herb Garden and in our Zone 5-11 Tea Herb Garden. This plant is sometimes available in plug trays. These trays hold 128 of all the same plant. They are a great low cost way to fill a lot of space. Each cell is 3/4 of inch by an inch. Check here to see if Lemon Grass Plug Trays are available. LEMON GRASS (Cymbopogan citratus): “Take thou also unto thee principal spices, of pure myrrh five hundred shekels, and of sweet cinnamon half so much, even two hundred and fifty shekels, and of sweet calamus two hundred and fifty shekels,” Exodus 30:23. Sweet smelling Calamus refers to the many aromatic grasses found growing in abundance in the Holy Land, of which Lemon Grass is one. In this scripture the Lord delivers instructions to Moses for the proper way to make and use Holy Oil. So valued was this oil that perfume was not even to be made in the same way.